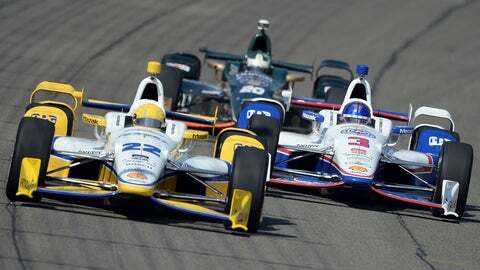 Simon Pagenaud and Ryan Hunter-Reay race side-by-side at speeds over 220 mph at Auto Club Speedway on June 26, 2015. FONTANA, Calif. — In just the third time the superspeedway Aero Kits have been used in a Verizon IndyCar Series races this season, drivers in Saturday’s 500-mile race at Auto Club Speedway. Some drivers such as two-time Indianapolis 500 winner Juan Pablo Montoya believe the aerodynamic rules this weekend may bring back pack racing – a thrilling form of competition that fans loves and drivers despise. But other drivers expect to see a variation where packs form on restarts, but the better cars will still be able to pull away to separate the field. IndyCar officials mandated a new aerodynamic configuration that will add about 300 pounds of downforce to compensate for the high track temperatures. The past three Verizon IndyCar Series races at the track have been contested under the lights. "We looked at the downforce increase that we had at Texas and saw marginal improvement in the degradation from the tires," IndyCar vice president of technology Will Phillips said. "Fontana is a little different in that it doesn’t have the tire degradation that Texas did when you go through the stats from 2014, so it’s just the challenge to drive the track, which is why it will have more downforce in the heat of the day." A sidewall – or trimmed sidewall – added to the underwing is among the aero kit-approved options. Front and rear-wheel guard closure panels that were added for the Firestone 600 at Texas Motor Speedway will remain part of the aero platform. "My concern is the drag level of the car," said pole winner Simon Pagenaud. "I’m worried about how easy it is to draft. In those situations you want to put as much downforce as you can and find someone to follow until the end of the race and then trim the car at the end. My car feels good so I’m pretty happy so far. There are so many combinations with downforce level you can run and we have two different Aero Kits with Chevrolet and Honda so that is not my problem." Montoya was more vocal in his concerns about the aero and drag levels. "I don’t feel it’s the right (aerodynamic) approach to come here to be close to a pack race, to be two, three wide in the corners like this, it makes no sense," Montoya said. "We’re hoping IndyCar does something about it. They’re putting themselves in a pretty bad spot." 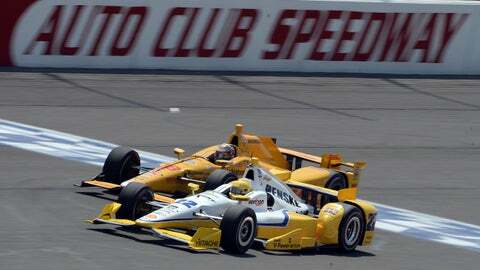 Other drivers did not necessarily agree with Montoya’s sentiment. "Once the cars fall off a bit at Lap 10, 12, 15, then you will have some understeer and teams will start trimming out the car," said 2012 IndyCar champion Ryan Hunter-Reay. "I think it’s going to be an exciting race." And that is what IndyCar officials are hoping for because the Firestone 600 at Texas Motor Speedway was a less than thrilling contest as Scott Dixon won by 7.8 seconds over Tony Kanaan with just five cars on the lead lap. "You just have to get through it," Dixon said. "It’s a 500-mile race. It’s similar to Indy but the track is very much different. A lot of dust and debris happens here but I expect the race to be very good. There will be different strategies like at Texas with people trying different things. "But, I don’t want it to be better than Texas because I did very well there. If Texas had another caution or two at the end of the race I think that race would have definitely been different." It appears the only drivers fearful of a pack race are at Team Penske, as many of the other drivers are confident Saturday’s contest won’t be like a flat-out affair where drivers never lift off the throttle. "There is always concern because the more flat-out you are, the less talent it takes to get up there," said defending Verizon IndyCar Series champion Will Power. "That’s not a good situation. We’ll see on Saturday. If it goes green for a while it won’t be a pack race but if there are a lot of restarts, it will. It’s not an easy fix in this situation with two different body kits. It’s a tough call. It was easier when all the cars ran the same configuration. I think it will be a very interesting race."